Cristiano Ronaldo says Real Madrid could be leading the Spanish league if everyone on the team was at his level. After a 1-0 home loss to rival Atletico Madrid on Saturday virtually ended the team’s chances of winning the title, Ronaldo criticized Spanish media for blaming him for the team’s poor performances and said that things could be different if others players were playing like him. Speaking calmly in a rare appearance in front of reporters after the game at Santiago Bernabeu Stadium, Ronaldo clearly expressed his dissatisfaction with how he’s being treated by Spanish media. Ronaldo had nine goals in the team’s previous seven matches entering Saturday’s derby, including seven in his last three games at the Bernabeu. He squandered a few good chances on Saturday, though, and last week missed a decisive penalty kick in the 1-1 league result at Malaga. 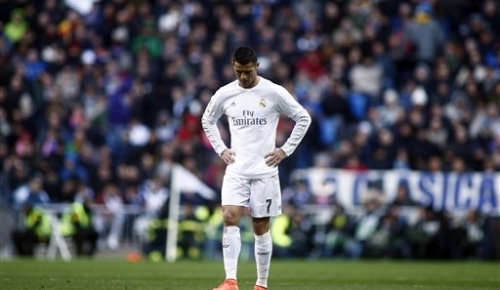 Ronaldo said the absence of injured starters was what was keeping Real Madrid from contending in the Spanish league. Real Madrid has been without Gareth Bale and Pepe because of injuries, and on Saturday coach Zinedine Zidane also could not count on left back Marcelo. Striker Karim Benzema returned to the squad after missing a game because of a back problem, but had to be substituted at halftime. After 26 rounds, Real Madrid is four points behind Atletico Madrid and nine points behind leader Barcelona, which hosts Sevilla on Sunday with a chance to tie Real Madrid’s record of 34 unbeaten games in all competitions set in 1988-89.